Explicitly, we can get one key point from Brandon that for numerous Skype users, recording video calls is a worth-expecting thing. In other words, getting a reliable and dedicated Skype call recorder may bring a lot facility. As a consequence, we are planning to show you a full list of top 6 best Skype call recorder software. Joyoshare Screen Recorder for Windows (or Joyoshare Screen Recorder for Mac) is an ideal Skype call recorder for Mac and Windows that has excellent ability to record both video and audio in high quality. Thanks to its advanced capturing technology, it is available to record not only Skype calls, but also YouTube videos, WebEx meetings, Facebook chats, Twitch streams, class lecture, online gameplays, streaming music, etc. Other than that, it comes with diverse recording options, making your Skype call recording professional. You can directly skip any unwanted sections, cut your recording into several parts or take screenshots by using shortcuts during recording process. Besides, you can also confirm your own preferences before initiate a task. 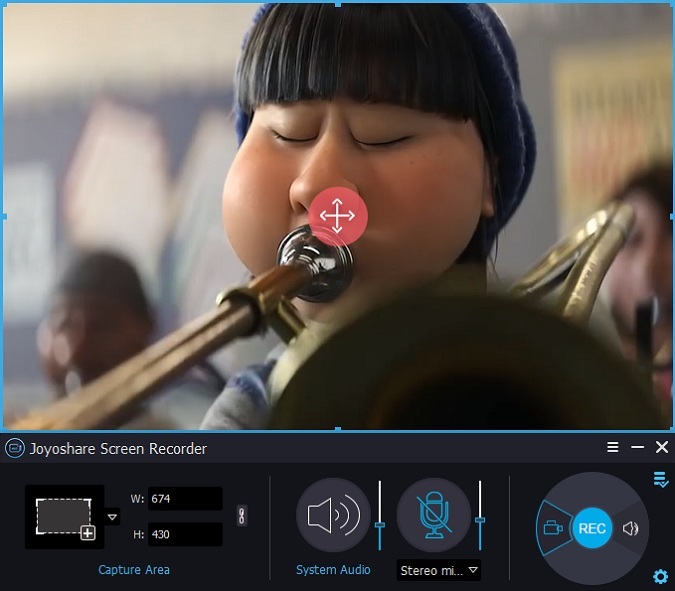 Clearly, Joyoshare Screen Recorder offers capability to customize capturing area, grab system audio/microphone sound, specify format configuration, schedule recording assignment, add cursor effects, etc. Importantly, any popular formats and portable devices can be supported without hassle when you are going to export the result. Pamela for Skype can be regarded as a superb Skype call recorder for Windows. If you are novice, you can benefit from its free version, Pamela Basic, which gives you utmost liberty to capture your Skype calls and play audio files when a Skype chat is in the process. Best of all, this Skype call recorder assists you to transfer a call to a designated contact or a specific group. Aside from that, you can even have right to record your podcast if you are a blogger. Amazingly, Pamela for Skype makes it possible to auto-reply your Skype chat when you are in inconvenience to reply a message or a video call, you are able to request the other party to leave a voice message, which will be saved and informed to you at a later time until you come back. Just as its names suggests, MP3 Skype Recorder is a tool that enables you to export your Skype calls in the form of MP3 so that you can feel free to play it on most of popular devices. This Skype call recording software can do a job in an efficient performance, which help you make recording instantly upon you get a Skype call. This smart Skype call recording software can even collect related info about any Skype calls and extract details for your reference, like the caller's name, phone number, dialing time, etc. Additionally, what stands it out from crowd is its marvelous ability to record and store two active calls at the same time in two separate files. 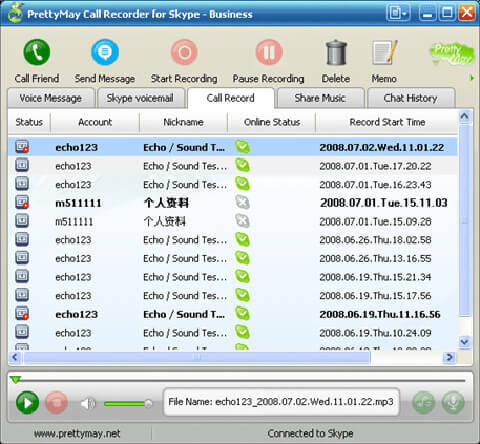 iFree Skype Recorder, a typical free Skype call recorder, is another good choice that can be used to record Skype calls in an simple manner. By means of this tool, it is worth to mention that you can only get a way to grab your calls' audio streams but the video chats is not supported for making recordings, which becomes tricky for the one who has this kind of need. However, some of its wonderful functions are enough to satisfy you. You are authorized to preset personalized messages as answering machine to auto-reply Skype chats when you have no time pick your calls on Windows. With the exception of it, you can as well have right to decide your sound record preference as you please. Namely, you can select mono or stereo output format for your audio as per your own requirements. Evaer Skype Recorder is also one of the best Skype video recorder tools that is capable of grabbing both audio and video in perfect synchronization. If you are on the way of learning it, don't hesitate. It can be a qualified assistant to record your Skype video and audio interviews, podcasts, conferences or family VoIP calls. Similar to some of the other Skype recorders, it also delivers a platform to send an automatic reply to Skype chats. Furthermore, this intelligent tool includes full support to different recording modes, like Skype video calls picture-in-picture, separate files, side-by-side, local-webcam-only along with remote-webcam-only. Thus, you can choose whichever you want at discretion. Remarkably, it also empowers you to preview videos during recording process. This Skype call video recorder, PrettyMay Call Recorder, can provide you with an attentive solution for your Skype communication, which makes it easy to record Skype calls as well as conferences. Well designed with stereo/mono mode option, it can help you export your recording in MP3 or WAV formats. What's more, PrettyMay Call Recorder can auto-answer your Skype calls as well during the time you are away from computer. Meanwhile, it's accessible for you to play captured voicemails, calls and audio files in Skype conversations in the way you like. Now you have a rough learning about 6 reputable Skype call recorder tools. 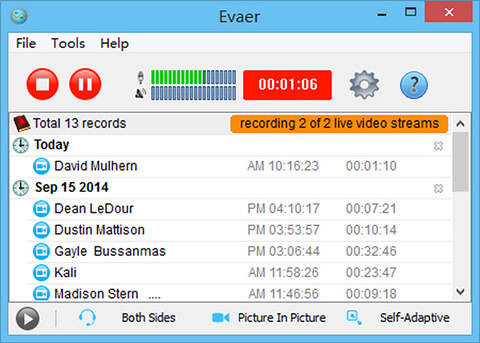 Generally speaking, Evaer Skype Recorder can record all kinds of Skype calls with different recording modes supported. 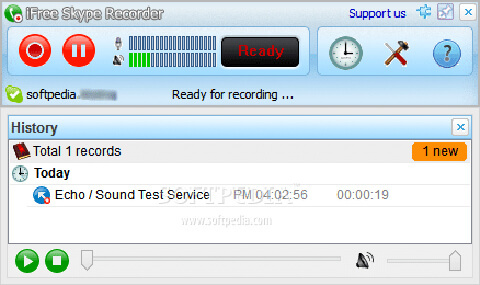 iFree Skype Recorder is a completely freeware for new starters that allows audio recording mode selection as well. You can also get to know that most of call recorders have the ability to send automatic messages in your busy time. However, if you feel like to strip needless parts and cut your recording, you should not miss Joyoshare Screen Recorder. Now you can go to consider which one is the right one that matches your expectation well.